Butterflies are a welcome sight in any garden. If you really want to attract the beautiful "flying flowers," you will need to provide a variety of plant material. As gardeners, we are also interested in the aesthetics of our gardens. 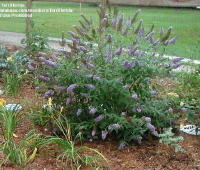 So you will want to include some shrubs in your butterfly garden design as the backdrop for the other flowers. A butterfly garden can be a delight for both gardener and butterfly. You must be aware, though, of the need for both nectar plants, which are food for the adult butterflies, and host plants which feed the babies (caterpillars). There are shrubs that fit both categories. 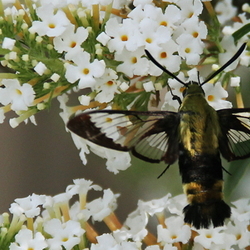 One of the most familiar and popular of the butterfly attracting shrubs is butterfly bush (Buddleja davidii, B. x weyeriana, B. lindleyana, and other Buddleja species). 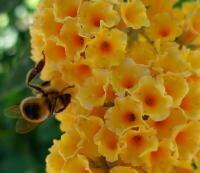 Buddleja (or Buddleia) is a nectar plant, generally growing 6'-8' and hardy zones 5a-9b. Buddleja davidii 'Black Knight', is a strikingly deep purple color and is shown in the opening thumbnail with a Red Admiral (Vanessa atalanta) butterfly having lunch. At left, 'Ellen's Blue' looks terrific in the garden setting. A quite different variety, Buddleja x weyeriana 'Honeycomb' [r], has bright yellow flowers with an orange eye which are displayed in balls along the stem. As you can see, bees love them quite as much as the butterflies. Just a note for those of you who are conscious of non-native plants: "Butterfly bushes (Buddleia davidii) are considered invasive plants in some areas, especially in warm climates. 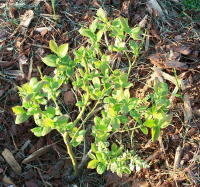 Take measures to confine butterfly bush within the bounds of your garden, such as removing volunteer seedlings." You can also deadhead (cut off the spent flowers) to avoid reseeding. 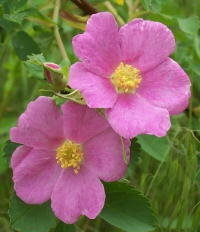 The common wild rose (Rosa woodsii) [l] is a host plant that I would not recommend that you plant in your garden, unless you have plenty of room for it to spread. It spreads by seed, but also has extensive rhizomes and will even survive fire to send up an abundance of sprouts. It is host to the Mourning Cloak (Nymphalis antiopa) butterfly. 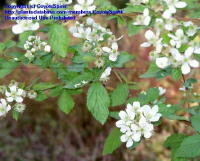 The shrub can be between 2' and 5' in height, hardy in zones 4a-8b. The flowers, ranging from white to dark rose in color, persist from May to July, followed by orange-red hips in the fall which have the added bonus of feeding birds and other wildlife in the winter. Host for another beautiful butterfly, the Spicebush Swallowtail (Papilio troilus), Spicebush (Lindera benzoin) [r] is a more mannerly plant. It grows 6' to as much as 12' in the right conditions. Pale yellow flowers in early spring are followed by red drupes (berries) that are enjoyed by many species of birds. The leaves turn a pretty yellow in fall and are fragrant when crushed. Hardy in zones 4-9. Note: a female plant is needed to produce berries. Here's a nectar plant loved by the Spring Azure (Celastrina ladon), White Admiral (Limenitis arthemis arthemis) and Zabulon Skipper (Poanes zabulon). But on this one, you get to eat the berries. That's if you can get to them before the local wildlife. It's the wild blackberry, or bramble (Rubus fruticosus). 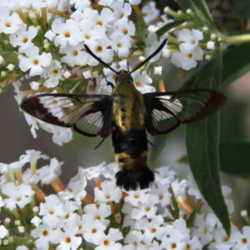 Some species of moths also use this shrub as a host plant for their caterpillars. Unfortunately, this is another invasive plant from Europe that is listed by the U.S.D.A. as a federal noxious weed . 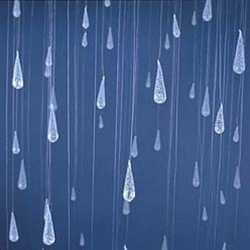 You can get around this by planting non-invasive cultivars, like 'Illini'. 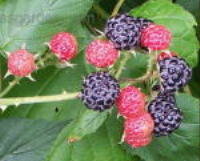 According to Miller Nurseries, 'Illini' has a taste much like wild blackberries but it has few lateral canes so it is easy to maintain in limited areas. Hardy in zones 5-8. There are others if you care to investigate. 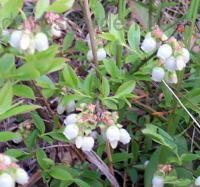 If you would prefer a berry with a tidier habit and no thorns, blueberry is also a nectar plant. It is a favorite of the Zebra Swallowtail (Eurytides marcellus). There is the lowbush or wild blueberry (Vaccinium angustifolium), highbush (Vaccinium corymbosum), rabbiteye (Vaccinium ashei) and others, depending on your particular climate. 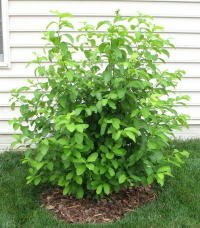 Highbush blueberries are also available in half-high and dwarf cultivars for the smaller home garden. 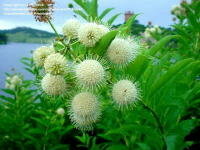 Buttonbush (Cephalanthus occidentalis) [l] is a native shrub also used for nectar by the Zabulon Skipper and other butterflies. It grows to 3'-6' in height and has creamy-white flowers in a distinctive ball shape in late summer. Autumn color of the leaves is yellow and orange. The fruit is a nutlet that is eaten by ducks and other water birds. Zones 4-10. Dogwood (Cornus) is used by the American Snout (Libytheana bachmanii) for nectar and the Spring Azure for both nectar and hosting. 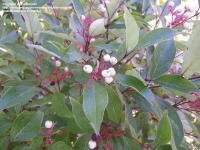 Many dogwood are trees, but St. Lawrence Nurseries lists several that are native shrubs. Red-panicled or grey-stemmed dogwood (Cornus racemosa) [r] is a 4'-8' shrub that has clusters of tiny red stems that spread out in a snowflake pattern. Birds love the white berries. Another that has great winter interest with its blood red stems is Red Osier dogwood (Cornus sericea) [l]. Only 3'-5' tall, it tolerates any type of soil, particularly wet soil situations. 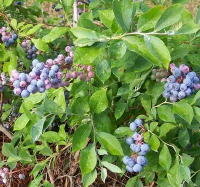 The berries of this variety are blue. It tends to sucker, so take that into consideration. The Baltimore Checkerspot (Euphydryas phaeton) enjoys nectaring on viburnum. There are so many varieties of viburnum that I could not begin to list them here. Most are hardy zones 5-9, but you should check the variety that interests you. Available in a variety of heights, many viburnums are extremely fragrant. Remember that you will need two of a related species for good fruit set. Here are just some examples. This should give you some ideas of shrubs you can include in your butterfly garden or in mixed gardens when you want to attract butterflies. For more information on plants, both nectar and host, to continue filling in your garden, try The Butterfly Website. There is also lots of good information at this site on gardening for butterflies. Here are a couple of other links; The Butterfly Site, Monarch Watch: Butterfly Gardening, The Butterfly House.org. As always, many thanks are due to the very talented photographers here at Dave's Garden, without whom these articles would not be possible.